Blak-Ray® delivers high intensity long-wave (365nm) ultraviolet light. 100 watt lamp for an intensity of 21,700 µW/cm² @ 5cm or 8,900 µW/cm² @ 25cm distance. Applications in microscopy such as specimen staining and curing polymers. At 45cm the spot-bulb produces a highly intense center of illumination approximately 13cm in diameter. The lamp head rotates a full 360° and can be removed for convenient hand use. The lamp head (scratch-resistant, powder painted aluminum) is connected to the transformer by an 6.5 foot (2m) cord. 365nm long-wave UV is not germicidal, germicidal effect requires UVC (100-280nm). A 12.7cm (5") Black Light filter is recessed in the head. A second filter option will reduce visible light, so that finer detail is achieved on the subject. High intensity ultraviolet lamps which give broad coverage of long wavelength UV for large areas. Two 15-watt self-filtering longwave tubes. 1600 µW/cm² of 365nm UV radiation at 15cm (6"). 365nm long-wave UV is not germicidal, germicidal effect requires UVC (100-280nm). The metal lamp housing with aluminum reflector is 502 x 152 x 108mm (length x widest section x depth) (19-3/4 x 6 x 4-1/4"). Includes wall brackets. Weight: 2.3kg (5 lbs). UL listed. 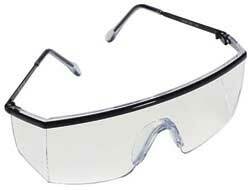 Wrap around lens provides front and side protection. Black metal frame with adjustable metal temples. The lens in these uv protective glasses absorbs 99.9% UV. Meets the High Impact Requirements of ANSI Z87.1-2003. Comfortable and stylish eyewear. Anti-fog, anti-static, anti-UV and anti-scratch. 100% polycarbonate material. Fits over most prescription glasses. Optically correct lens. Clear no distortion lenses and black frame and adjustable temples. Meets ANSI Z87.1 and CSA Z94.3 standards.